This is my second project for Angela's RSC 2017 at soscrappy. It is not yet in the flimsy stage because I am a bit perplexed as to what/how to get it there. You may think so...just what is the problem, Sandra? There are two more rows, a pink one and a brown one. Again, so? Well, it currently measures 60X84 with just these seven ROYGBIV rows. A nice lap size. If I add the other two rows, it will be 60X108 and that is just a very weird size. So think on that while I show you the last two month's of blocks that I just finished. Here is September's row which was reds with a pop of gold. Remember I inadvertently began playing with moving from light to dark in both the main colour and the 'pop' of colour. 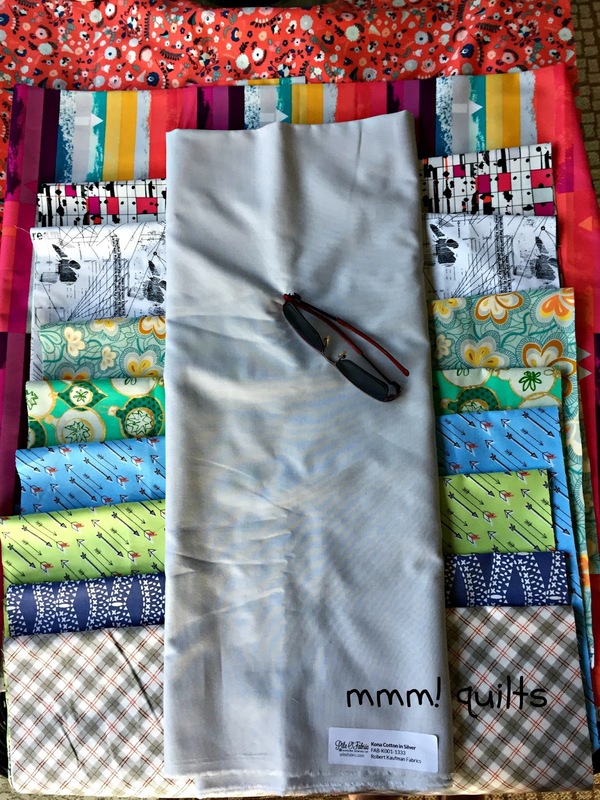 It was really fun and pushed me a bit to find 24 fabrics in my scraps and stash that would work. Three of the blocks always got two very dark bars, usually in black with the theme colour on it. This is a great black with red dots batik that I used in Brianne's wedding quilt. Sigh, I knew it was too good to be true to have three photos un-photobombed by Bella! In her defense, this row is full of kitties! I want them both as part of the front of the quilt! I thought I'd put the pink at the top, as it would come before red, since you add white to red to get pink. Then I figured I'd put the brown at the bottom. I love the teddies fabric, scraps from Dayna's first quilt I made her, the cows, from two runners, one for an aunt, and another for an uncle. 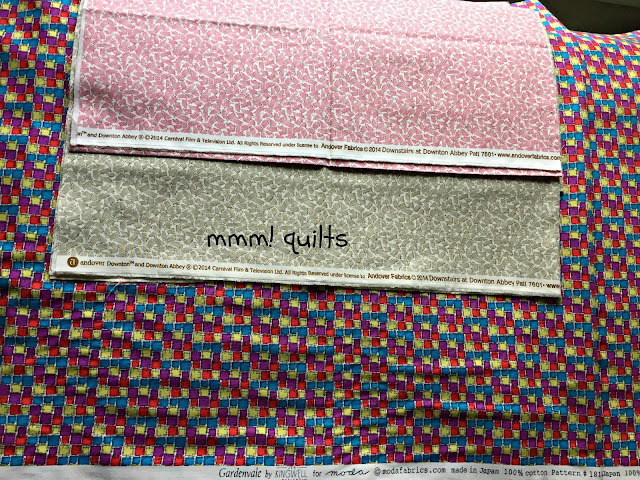 There's a rayon challis floral fabric from which I made a skirt centuries ago for myself, and the middle pink 'ring' fabric is from my mum's 70th birthday quilt, another scrap from my niece's housewarming quilt...so you start to see the memories just this one row evokes. Food!! 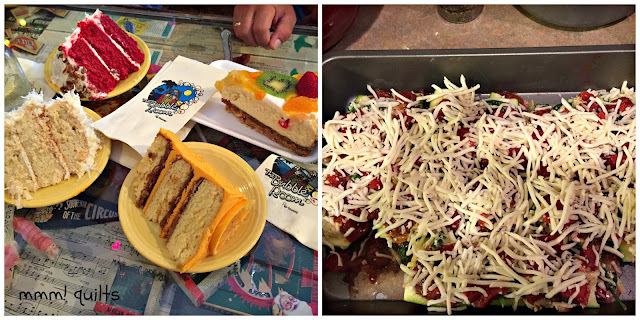 On the left is cake we had at The Bubble Room Restaurant -- MacGyver's hand is there so you get the idea of the MASSIVE piece you get! On the right is a delicious dish I made this past week, Veggie Lasagna Zucchini Boats. Okay I'm salivating...where was I? Oh yeah, Julie! She suggested a rainbow-striped fabric to add to the left and right sides of the quilt so it extends it horizontally. I like that idea; I had already thought about running the pink row and the brown row down those sides, but because the blocks are not the same size (one is 12" square, the other 8X12") that doesn't work and doesn't look right. I also thought maybe I'd put the brown row on the back; I usually do interesting quilt backs anyhow. That would mean the length would only be 96, and if I extended each side with a rainbow-theme fabric by 12" I'd have 84" across. Your thoughts are most welcome. One other question, what do you think about alternating the run of each row? i.e. row 1 goes light to dark, but the second row would run dark to light? I will try that tomorrow morning perhaps in the early morning before the dogs get up! Backing for RSC2016 project #1, perfect! This arrived from Fat Quarter Shop, along with two zipper pouches, one free from FQS, the other 22c (yes!) from Moda. Gardenvale by Jen Kingwell (on sale) is going on the back of my project #1 for RSC, Whirling Stars. The other two hopped into the order, being Downton Abbey 'Downstairs' fabric, why not, and on sale, yes please! Speaking of fabric, remember this lovely bundle? All of these were $6 and under per yard! If you'd like to have a chance to win $10 to spend at Pile o' Fabric then check out my previous post where I have three prizes up for grabs for the Sew Mama Sew Giveaway day. Giveaway ends tonight, Dec. 11, and I will announce the winners on Monday. If you haven't already got their email, or need some last-minute stuff for Christmas, Craftsy is having several sales, on kits and supplies, as well as on top classes. They do ship extremely fast! That is an affiliate link, and I wholeheartedly appreciate those of you who have clicked through to their site through me. Thank you! Now go put your name in for a chance to win one of my 3 giveaways! 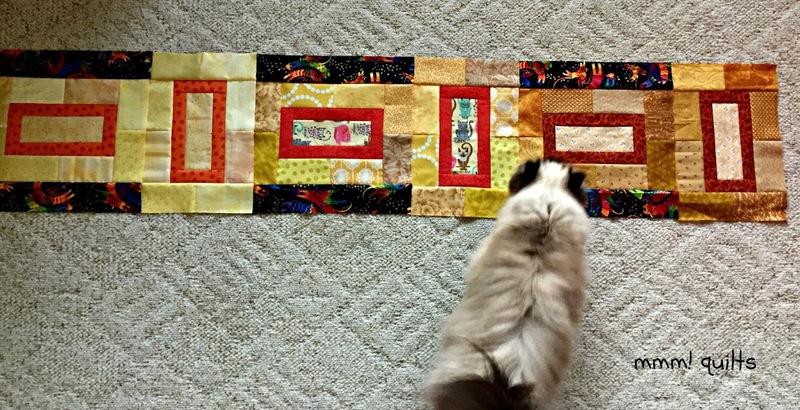 Make two quilts. One with the brighter colours (purples and teals) and one with the darker colours (reds and browns). You may need to make more blocks. But you should be able to get at least one together. Gorgeous blocks Sandra. I like the way they are lined up here and I would probably leave it at that size and I guess put the others on the back. You've picked up some great fabrics there at a wonderful price. Those Avant Guard Fabrics are devine. I know you want them on the front but honestly I would put the pink and brown on the back. The quilt looks incredible as it is! Alternatively how about using neutral shades for side borders? Your fabric haul is fantastic, great deals! Lovely blocks! Not sure about what next though, maybe two quilts? That is indeed an odd size if you add the strips to top and bottom. How about a zig zag approach to this as well where the rows are offset and some other fabric (black scrappy maybe?) is added either to the beginning or end of the row to get the width up to balance the length? To add more rows you need to make it wider to restore the balance I think. The colours you have got now look great. That is SO pretty - I love it! I like the idea of switching the rows end to end. Alternating the value progression would make the quilt that much more interesting. Other than that, I'd say to make another block or two of each color to balance out the size of the resulting quilt. Although, I'm sure that whatever you decide to do will look GREAT when it's all done!! Hmmm, I vote with some of the others that the brown and pink rows go on the back, or are saved for a second quilt. 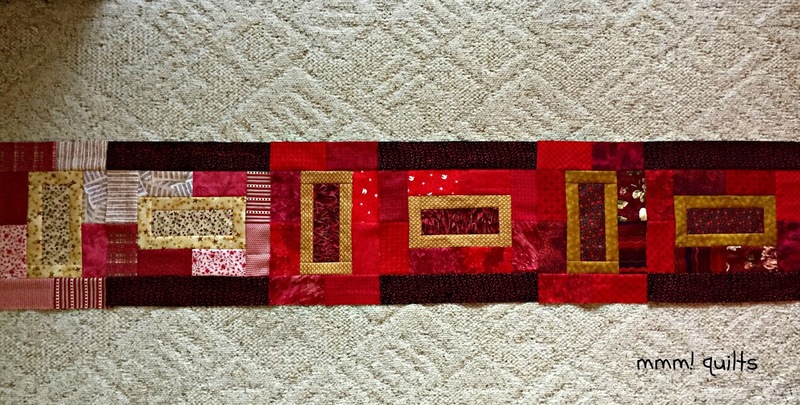 Love Yvonne's suggestion of offsetting the rows with scrappy black to gain width. Looking forward to seeing what you decide. It will be lovely, I'm sure! LOL Sandra, I didn't know anyone could get up before the dogs get up. The way it looks in your first photo looks so cool! I would leave it like that and put the pink and brown rows on the back of the quilt. I like Yvonne's idea of offset rows too. Must you make them into a quilt? They bring so much joy just as they are :-D Honestly, you could use them to teach a class on Color Theory. I love how they go from very dark rectangles (light background) to merging with the background to very light rectangles in a dark background. These look awesome. If you want them all on the front of the same quilt, can you off set them to the left and right and fill in the sides with something? That would make it more proportional. I also like the idea of using on the back and of making two quilts. 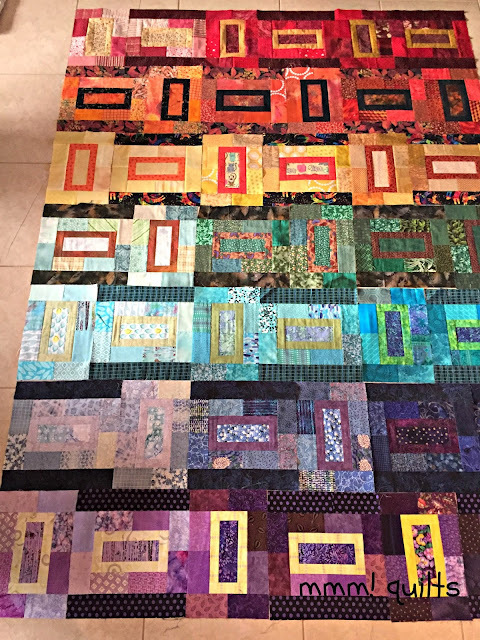 I like the idea of adding the additional strips on the sides, that would give you a very nice size and aspect ratio to the quilt. I agree with some of the others add them to the back, I like the top the way it is! This just looks better and better. I love it. Love all of your posts. Your flimsy will make a beautiful quilt.